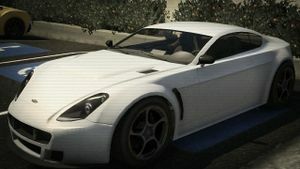 A Rapid GT in Grand Theft Auto V.
The Dewbauchee Rapid GT is a sports car in Grand Theft Auto V.
The Rapid GT is based primarily on the Aston Martin V8 Vantage Roadster, with the front of a Ferrari California. The Rapid GT has a somewhat decent acceleration, taking 4 seconds to reach 60 mph (97 km/h). The Rapid GT's top speed of 192 mph (309 km/h) is among the higher ends of the non-supercar class. Rapid GT Soft Top, a soft top version of the Rapid GT. Exemplar, a four-door version of the Rapid GT and Rapid GT Soft Top, based on an Aston Martin Rapide. This page was last modified on 5 February 2015, at 02:35.